This landmark book chronicles the development of a kind of photography that is created out of the energy and chance juxtapositions found in everyday life on the street. Street photography is at the heart of what makes photography unique. 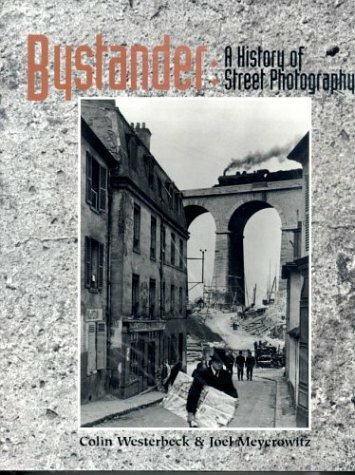 An unprecedented study that is the first history of this tradition ever published, Bystander explores street photography through a discussion of the medium's masters - Atget, Stieglitz, Strand, Cartier-Bresson, Brassai, Kertesz, Evans, Levitt, Frank, Arbus, Winogrand, and many others - and reveals along the way much about the craft and creative process of photography. Profusely illustrated with the work of more than eighty photographers, the book is composed of four parts separated by lively folios of pictures. Each part discusses a different era - from the early days of the medium in nineteenth-century Europe, to America in the late twentieth century - and devotes entire chapters to the key figures of that period. COLIN WESTERBECK is curator of photography at the Rat Institute of Chicago.JOEL MEYEROWITZ is best known for his large-format colour work but began his career as a street photographer in the 1960's.